We’d love your help. Let us know what’s wrong with this preview of Moonpenny Island by Tricia Springstubb. From Tricia Springstubb, author of What Happened on Fox Street and Mo Wren, Lost and Found, comes a deeply affecting and memorable story about a young girl’s coming of age on her small island home. Moonpenny is a tiny island in a great lake. When the summer people leave and the ferries stop running, just the tried-and-true islanders are left behind. Flor and her best, her p From Tricia Springstubb, author of What Happened on Fox Street and Mo Wren, Lost and Found, comes a deeply affecting and memorable story about a young girl’s coming of age on her small island home. To ask other readers questions about Moonpenny Island, please sign up. is this book more about adventure or friendship? Primarily A It's more about friendship and seeing things from someone else's perspective. Flor and Sylvie are best friends. They have been forever. They live on a tiny island in the middle of a huge lake. In summer, the island teems with people, but when autumn comes, the summer people leave and Flor and Sylvie are the only two eleven-year-old girls for miles. But when this summer ends, things change. Sylvie’s parents send her to live with relatives on the mainland and go to school there. Flor and Sylvie can email and talk on the phone, but it isn’t the same. Flor’s mother also leaves to stay with her mother and sisters on the mainland because, she says, her mother is ill. In addition, Flor’s older sister, Cecelia, seems to be pulling away and just isn’t there for Flor anymore. Their father seems to work all the time. Flor is bereft and lonely. This book is perfect. Beautiful writing. Wonderful characters with believable flaws and problems. Gorgeous descriptions of feelings of frienship, siblings, and growing up. I hated to leave Moonpenny Island. Give this book a Newbery, please. Moonpenny Island by Tricia Springstubb is a book about Flor O’Dell and Sylvie Pinch. Flor and Sylvie are best friends they are the only eleven years olds around. Summer is coming to an end and Sylvie has some shocking news. She is going to live with her aunt and uncle and the worst part is she’s going miles and miles away from the island. There is nothing the two can do about it. Shortly after Sylvie leaves Flor soon finds out her mother is leaving the island too. She leaves to go help a sick r Moonpenny Island by Tricia Springstubb is a book about Flor O’Dell and Sylvie Pinch. Flor and Sylvie are best friends they are the only eleven years olds around. Summer is coming to an end and Sylvie has some shocking news. She is going to live with her aunt and uncle and the worst part is she’s going miles and miles away from the island. There is nothing the two can do about it. Shortly after Sylvie leaves Flor soon finds out her mother is leaving the island too. She leaves to go help a sick relative and doesn’t come back. After their mom leaves Flors’ sister Celia goes from good, smart, always studying student to someone who keeps secrets, sneaks out at night, lies and worst of all, does dangerous things. Flor tires to stop this but there is nothing she can do to make her sister stop or even listen to her. Will this family fall apart without their mother? The author of What Happened on Fox Street returns with a beautiful story set on a little island in a large lake. Flor loves her island home, loves being able to ride her bicycle everywhere, loves that her best friend is the only other person in her grade at school, and loves that she knows all of the people who live there year round. But things start to change that Flor has no way to control. Her best friend is sent off the island to attend a different school, leaving Flor the only person in six The author of What Happened on Fox Street returns with a beautiful story set on a little island in a large lake. Flor loves her island home, loves being able to ride her bicycle everywhere, loves that her best friend is the only other person in her grade at school, and loves that she knows all of the people who live there year round. But things start to change that Flor has no way to control. Her best friend is sent off the island to attend a different school, leaving Flor the only person in sixth grade. Flor’s mother leaves to take care of her sick grandmother, and with her parents always fighting, maybe she won’t be back. Even her very responsible older sister is hiding something from Flor. Flor has to figure out how to live in this new island landscape where everything is changing around her. But in change there is also opportunity, perhaps a new friend (or two) and also seeing things for what they actually are. Springstubb writes a love letter to her island setting. She imbues each bike ride of Flor’s with a beauty and a celebration of this small island and its nature. Her writing sparkles like sun on the water as she picks unique metaphors to show both her characters emotions and the setting. Here is one of my favorite examples: “Her heart’s a circus, with trapezes and tightropes and people shooting out of cannons but no nets – someone forgot the nets.” Springstubb also shows emotions rather than telling about them. Flor’s emotions come out in the way she digs her toes in sand, how she pedals her bicycle and through what she notices in the island itself. Flor is a great young protagonist. She reads like an eleven year old, desperate to hold her family and friends together. She has a youthful and frenzied love of her island, something that readers can see may change in the future but it is her connection to this place that makes this book work so beautifully. She is fiercely protective of her siblings, throwing herself in to defend and protect them even as she proves that she has no understanding of teen love, something refreshing in a young protagonist. My thoughts: Loved this story and especially enjoyed reading about the simple island life in the book in addition to how different people deal with conflict, alcoholism, and more. Great for kids who might be dealing with friendship problems. Also good for discussions on alcoholism and how it impacts more than just the person drinking. I didn't like this book. The story was boring; nothing happens, at least that's what it felt like. I think it was supposed to be more dramatic than it was. I didn't like any of the characters either. I just didn't connect with anyone. The setting was nice, though. I like an island setting. Moonpenny Island, by Tricia Springstubb, offers readers a glimpse into life on an island: busy during the summer months, often lonely during the winters. The small population of islanders after the summer season makes for small classes at the island school. In Flor's grade, there has been only one other student-her best friend Sylvie. But this year, Sylvie is going to the mainland to live with her aunt and uncle, and attend school. What will Flor do without her best friend and confidante? This s Moonpenny Island, by Tricia Springstubb, offers readers a glimpse into life on an island: busy during the summer months, often lonely during the winters. The small population of islanders after the summer season makes for small classes at the island school. In Flor's grade, there has been only one other student-her best friend Sylvie. But this year, Sylvie is going to the mainland to live with her aunt and uncle, and attend school. What will Flor do without her best friend and confidante? This sudden and disturbing change is the first of many that Flor will have to endure throughout the course of the story. Through it all, Flor will learn about the challenges of living on an island, and the joys and sacrifices that are all a part of growing up. This book drew me into the story at the beginning, as we see the deep friendship that Flor and Sylvie have with one another. But as Sylvie leaves the island, and we get to see into Flor's life, it became somewhat sad for me. There were so many changes taking place in Flor's life, and most of them were depressing. The author alludes to several occurrences throughout the story that Flor can't wrap her head around, but it helped me see the direction that the story was heading. As the story began to resolve some of the issues, I felt like something was missing. Perhaps it was because the story ends mid-year, and I was left wondering things like: Whatever happens to Joe? What will Flor's and Sylvie's friendship be like when she returns for the summer? Where will Jasper fit into their friendship? What does the future hold for Flor's family? Sylvie's family? . I guess I feel like I need a sequel to see how the lives of these characters end up. Flor loves living on a small island in Lake Erie. She doesn't mind that in the winter there are about 200 people; she loves the way the island is quiet when the summer visitors are gone. She has always had a very good friend, Sylvie, who was just her age, but when Sylvie's older brother runs into problems, Sylvie's parents send her to the mainland to go to a school there. As the only 6th grader, Flor is lonely, especially when her mother goes to Toledo to take care of her grandmother. Being the Flor loves living on a small island in Lake Erie. She doesn't mind that in the winter there are about 200 people; she loves the way the island is quiet when the summer visitors are gone. She has always had a very good friend, Sylvie, who was just her age, but when Sylvie's older brother runs into problems, Sylvie's parents send her to the mainland to go to a school there. As the only 6th grader, Flor is lonely, especially when her mother goes to Toledo to take care of her grandmother. Being the only 6th grader isn't much fun, and she's not overly fond of Mrs. Defoe, even though they both like Anne of Avonlea. When she meets Jasper, whose father is studying trilobites on the island, things get a little better. The two have some adventures, but there is overwhelming sadness everywhere in Flor's life. Her parents had been fighting, which is one reason her mother left, and Flor is concerned that her mother is tired of life on the island. Her older sister Cecelia is acting oddly, and Flor doesn't know quite what is wrong, but she's worried that she is losing her, too. Eventually, even Jasper has to leave, and Flor is not quite sure how her life will continue with all of her losses. Strengths: Absolutely brilliant setting. Having been to Kelley's Island a couple of years ago, I can imagine what the school is like, and the interactions of the various residents are fascinating. The problems that Flor faces are all very realistic and well portrayed, and the book moves along well. Springstubb is an engaging writer. Weaknesses: The wonderful setting begs to have a FUN summer story instead of all of the sadness. I also found it a little hard to believe that Mrs. Defoe had been assigning Anne of Avonlea for over 40 years. Why start with book two? Flor lives on a tiny island in Lake Erie not far from Toledo, OH. It's a popular vacation spot, especially for birders, and most everyone who lives on the island year round is connected to the quarry. As the summer ends and the school year begins, Flor is looking forward to being 1 of only 2 6th graders on the island (the other being her best perfect friend Sylvie), but when Sylvie announces that she will be moving in with aunt and uncle in Toledo, Flor's whole world begins to change. Sylvie's fa Flor lives on a tiny island in Lake Erie not far from Toledo, OH. It's a popular vacation spot, especially for birders, and most everyone who lives on the island year round is connected to the quarry. As the summer ends and the school year begins, Flor is looking forward to being 1 of only 2 6th graders on the island (the other being her best perfect friend Sylvie), but when Sylvie announces that she will be moving in with aunt and uncle in Toledo, Flor's whole world begins to change. Sylvie's family owns the quarry and from a distance seem perfect and rich, but as Flor will learn they are protecting some very big secrets. Meanwhile, Flor's family is cracking at the seams. Her parents argue about anything and everything and her perfect sister is becoming distant. When Flor's mom leaves the island to care for her own ailing mother Flor and her siblings can't be sure she'll ever come back. With her only friend in a new school, Flor meets a new girl named Jasper (after the rock/mineral) and her geologist father who is studying trilobites on the island. Jasper is straightforward and struggles with self-esteem related to a birth defect, but the pair grows close over the course of the school year. Flor also gets to know a boy named Joe who is also dealing with some family issues. His father drinks more than he can handle and Joe spends a lot of time covering for him. Joe helps Flor see a different side of herself, a part unconnected to Sylvie. Using a theme centered around the evolution of sight, the author beautifully weaves a coming-of-age story about the changes in life and the situations that tests the bonds we form and prove their resiliency. The dialogue is superb, especially the scientific observations Jasper and Dr. Fife make as they speak to both trilobites and islanders. My favorite read of 2015 so far. Springstubb's characters will linger with you long after you have finished this engaging title. Middle grade fiction is full of charming, quirky communities, but Moonpenny Island balances the unique character of a small town on an island with a richly authentic emotional experience to which many young readers will relate. The quirk is never overdone, and the characters are so much more than caricatures. From Flor's parents, struggling to connect with each other a My favorite read of 2015 so far. Springstubb's characters will linger with you long after you have finished this engaging title. Middle grade fiction is full of charming, quirky communities, but Moonpenny Island balances the unique character of a small town on an island with a richly authentic emotional experience to which many young readers will relate. The quirk is never overdone, and the characters are so much more than caricatures. From Flor's parents, struggling to connect with each other and their growing children, to Flor's best friend Sylvie, who takes on the challenge of a new school away from the island while worrying about the family she's left behind, the secondary characters have depth and provide layers of interest for young readers. And Flor, caught between siblings and parents and friends new and old, will tug at your heartstrings. On the cusp of adolescence, she struggles with new responsibilities and very grown-up concerns, and finds it harder to retreat into her childhood games of imagination. But there are also plenty of moments of joy as Flor makes surprising new friends, connects with a teacher she once dreaded, and watches her small town, and her family, evolve. Flor and Sylvie are the only 11 year olds on Moonpenny Island, a tiny island in a great lake. When the summer people leave, there are only a handful of families left on the island and when Sylvie leaves for boarding school on the mainland, Flor is devastated. It doesn't help that Flor's mom has to leave to care for Flor's sick grandmother or that Flor's older sister has a secret she's not sharing. Gradually Flor learns that she can cope with all these issues of growing up, she can cope and thriv Flor and Sylvie are the only 11 year olds on Moonpenny Island, a tiny island in a great lake. When the summer people leave, there are only a handful of families left on the island and when Sylvie leaves for boarding school on the mainland, Flor is devastated. It doesn't help that Flor's mom has to leave to care for Flor's sick grandmother or that Flor's older sister has a secret she's not sharing. Gradually Flor learns that she can cope with all these issues of growing up, she can cope and thrive. This is a sort of introspective story that reminded me of all the thinking and pondering middle school aged girls do. All the while, they're coping with secrets and difficult life issues. In this book, alcoholism, parental arguments, abandonment, and hard partying are mentioned but very gently. Flor's dad, the police chief of Moonpenny Island, has a few things to say about living in such a small community: "The best thing about living here is, like it or not, we gotta depend on each other. A place this small, we either have each other's backs or we're sunk." The only eleven year-olds on the small island, Flor and her best friend and soulmate, Sylvie, share everything and lead an idyllic life. At the end of the summer, however, suddenly everything changes. Sylvie is mysteriously sent to the mainland to school, Flor’s mother disappears supposedly to take care of her mother, her sister Cecilia is harboring what appears to be a dangerous secret and Flor is strangely asked to watch out for Sylvie’s wild brother. Nothing seems to make sense anymore, no on The only eleven year-olds on the small island, Flor and her best friend and soulmate, Sylvie, share everything and lead an idyllic life. At the end of the summer, however, suddenly everything changes. Sylvie is mysteriously sent to the mainland to school, Flor’s mother disappears supposedly to take care of her mother, her sister Cecilia is harboring what appears to be a dangerous secret and Flor is strangely asked to watch out for Sylvie’s wild brother. Nothing seems to make sense anymore, no one is talking, and everyone suddenly has secrets. This is a wonderful, warm tween novel about love, friendship, family and living with change. I always enjoy a good juvenile fiction book and this one was no exception. There is so much wonderful reading for this age level that gets missed because people think it will be too simple and not deal with difficult issues. This one is a story of Flor and her family and the other folks who live on Moonpenny Island in the Great Lakes. There are family issues, friendship issues, and growing up issues all enfolded together. This said, the writing presents the story is such a readable way. Enjoyabl I always enjoy a good juvenile fiction book and this one was no exception. There is so much wonderful reading for this age level that gets missed because people think it will be too simple and not deal with difficult issues. This one is a story of Flor and her family and the other folks who live on Moonpenny Island in the Great Lakes. There are family issues, friendship issues, and growing up issues all enfolded together. This said, the writing presents the story is such a readable way. Enjoyable. 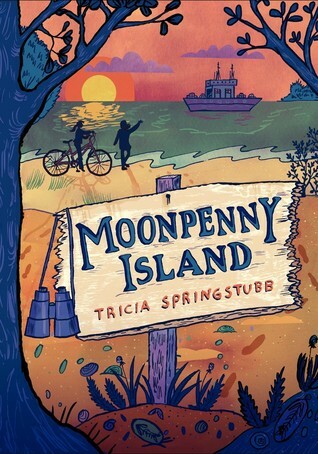 Moonpenny Island by Tricia Springstubb is a great book all about friendship and change. Flor is perfectly happy with her life until her best friend leaves and so does her mother; all while a mysterious girl shows up. Springstubb writes about the small island and swimming hole plunging you deep into the story and reluctant to come out. I recommend this book to anyone who loves a deep story and a beautifully written book. This was a nice surprise! It began by introducing our two best friends, girls who love gallivanting around their peaceful island home on their bikes, which they pretend are horses, and I thought... meh. But by the end of the chapter I was hooked. I love that these girls have to face some tough circumstances, and they do so with genuine effort and emotion. They are not perfect, and neither are the adults in their lives. Excellent little book! An awful lot of drama packed into a very short time on one little island. There are so many things that are introduced to no real point, and the book leaves many questions unanswered. I'll stick with Bright Island instead. I read an ARC of this story about a girl growing up on a small island, where life has always been the same until things begin to change. Her mom and best friend go away, a new girl comes to live there, and her sister is changing. The book's themes of evolution and slowing down to see what is "right there" will lead to great discussions in upper elementary classrooms. Started off a little slow and I had trouble with the narration style at first. However, after a couple of chapters I was able to sink into this quiet story of friendship and family. Good for 4th-5th grade. Just when I thought I couldn't stand another book about a young girl's coming of age, along comes this gem. Read my full review here. Not sure about appropriateness for 9- to 10-year-olds - alcoholism, older sister sneaking out, perhaps better for slightly older readers? I enjoyed this book because of the trials and tribulations the main character faces. Her mother leaves the family to "think", her best friend leaves the island to start school on the mainland, and her relationship with her sister has serious challenges. As Flor deals with these issues, she grows emotionally and as she sorts out her feelings, she learns to trust and love herself. Beautiful writing- whimsical and honest.